Digium is always releasing new Switchvox PBX software addons that make using the product a delight. The newest option, Notifier v6, will make users who live and die by Microsoft products very happy. Easily place a call to one of your Microsoft Outlook contacts from Notifier’s dialer or see (via screenpops) who is calling you directly from your computer’s display. To find out more details, you can download the Notifier User Guide here. Did I forget to mention that it’s FREE? 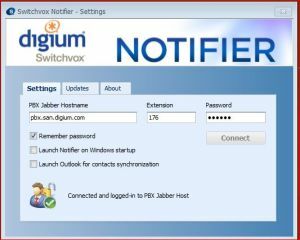 That’s right you can download Switchvox Notifier v6 for FREE here.